A BITTER SATURDAY IN THE MIDDLE OF JANUARY, WE HEAD FOR THE FLOODPLAIN OF INDIAN CREEK IN SEARCH OF A BLOOMING FLOWER. 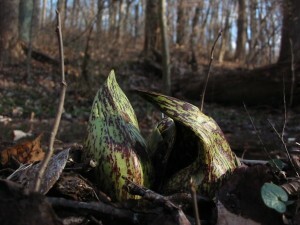 WE FIND A GREEN PLANT WITH A BLOOM: THE SKUNK CABBAGE IS HERE! 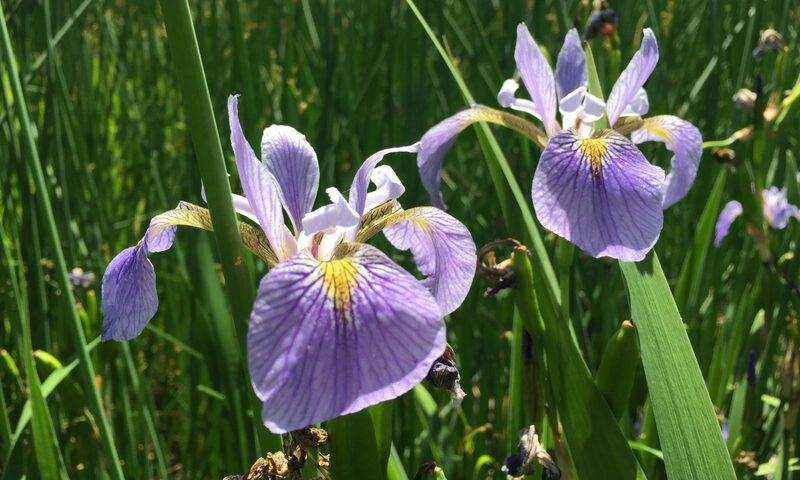 If the middle of winter has you yearning for green blooming things, you are one wooded floodplain or swamp area away from discovering the blooming flower you need at this time of the year. Green in January. Blooming in the dead of winter, the Skunk Cabbage is the happening flower to see. 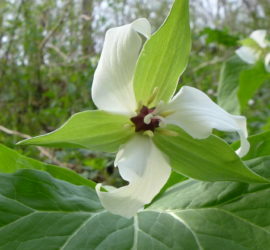 This plant creates its own heat, so if it snows, it can melt the snow around it so its blooms will be pollinated. We have yet to see this feature of the plant in action. The next snow we have we will be down on the Indian Creek floodplain to witness this wonder of nature. 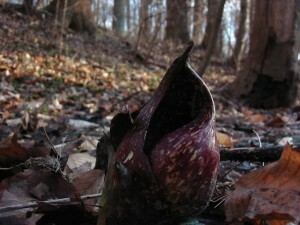 Today, we actively sought out the Skunk Cabbage, hoping to see a blooming flower in the middle of January. To live in the vicinity of Skunk Cabbage in the dead of winter is something we appreciate. Just go down to the low spots, along a creek or stream, and the Skunk Cabbage can be found blooming in the winter. 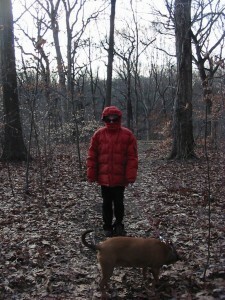 A cold and windy day in Morris Park. 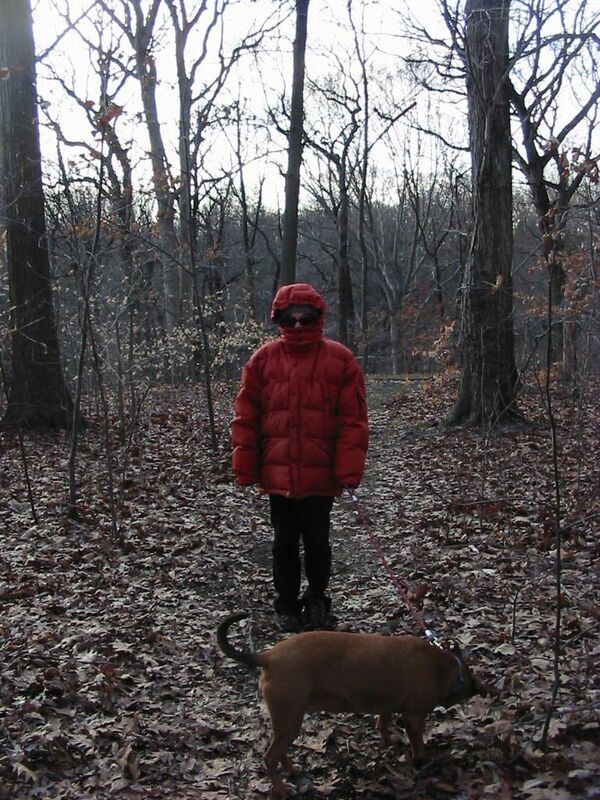 In the upland forest area on the Morris Park Road trail, we needed to bundle up. This is a great time to appreciate the silhouettes of the trees in that winter light. The sun breaks through and creates startling images of the forest. The winter sun illuminates the structure of the land, its topography and mass is presented in a raw manner. The steep hillsides and the creek are bare to the world. 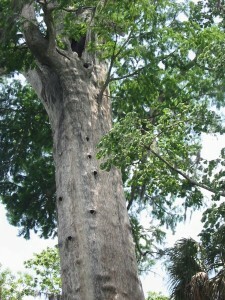 The plants and trees the same. Sticks in the ground of varying sizes, also barren. 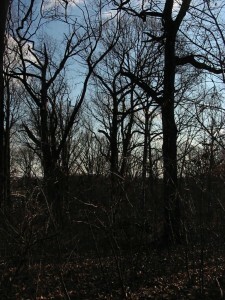 The ground is exposed as well, covered only with dead leaves that have become brittle. Under the leaves are the many dormant roots, with vital buds waiting for the right moment to grow. 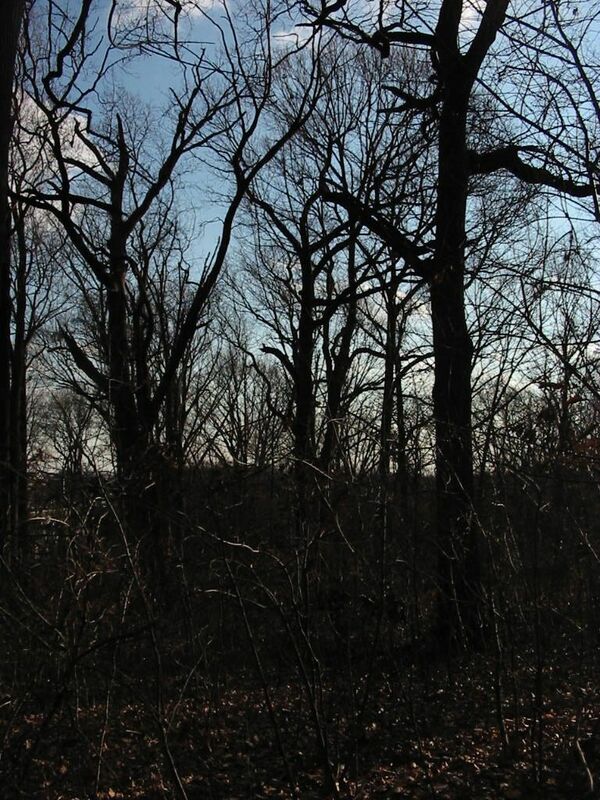 The leafless trees also wait. The winter sun gives us an impressionable light. An unmistakable brightness and contrast to the darkness of winter. Like the blooming Skunk Cabbage, the shining winter sun is much appreciated.